Rachael Ray and I have had our ups and down. I still can’t quite forgive her for Christmas 2008 and her Jacques Pepin Smashed Potatoes, which were supposed to cook in just 30 minutes but took more like 50. Yes, you’re supposed to try recipes first, but I watched her cook it start to finish on her show, so I thought that counted. Magic of television. Plus, I tried the recipe twice more, and while the potatoes are delicious, they do not take just 30 minutes. And I still can’t bring myself to call extra virgin olive oil “EVOO.” Sorry. But I do like her magazine and watch her show if I happen to be around and happen to turn it on. I even watched her True Hollywood story– or was it Biography?– about how she worked her way into a cooking show, nay, an EMPIRE (please think this in a very dramatic voice) through her own hard work and spunkiness. 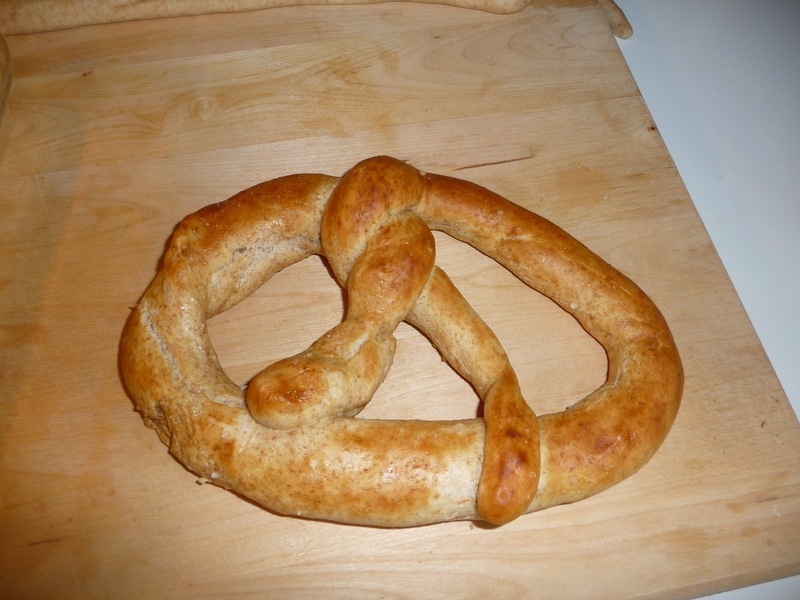 A week ago, I got a score of free Rachael Ray magazines from the library and found a Giant Bavarian Pretzel recipe. Because I owned all the ingredients, save yeast ($1.99 for three packets) and unsalted butter ($4.99, on sale) I had to try it. While the oven was heating, I prepared the dough. This part took so long that the oven finished heating about 10 minutes before I was ready. 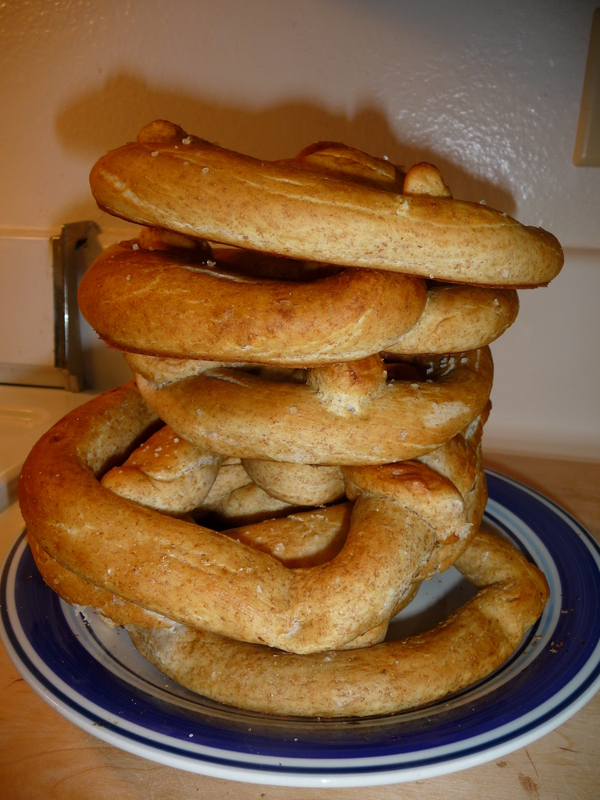 I decided to DOUBLE the recipe, because the original only made 6 Giant Pretzels. Six might not be enough. We like our pretzels. 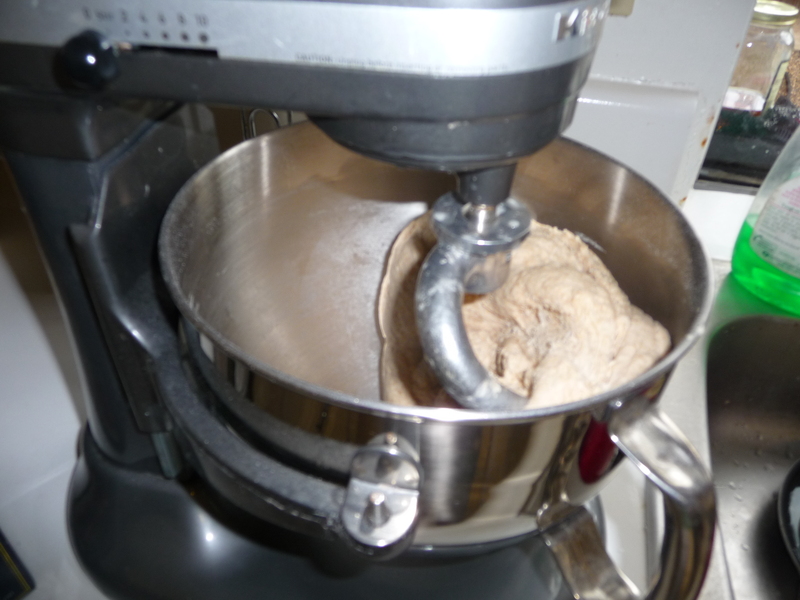 I dug out my big mixer and attached the dough hook. I didn’t have enough white flour, so I used half wheat. The dough mixed for about 6 minutes and the mixer engine began to smell like it was overheating. Is my mixer about to die on me? 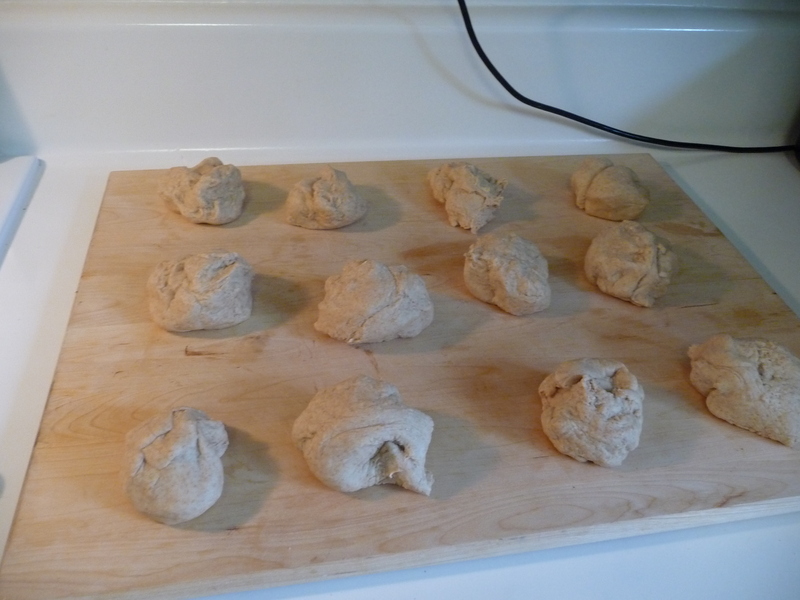 I separated the dough into 12 more-or-less equal size balls. Here’s the fun and interesting part. 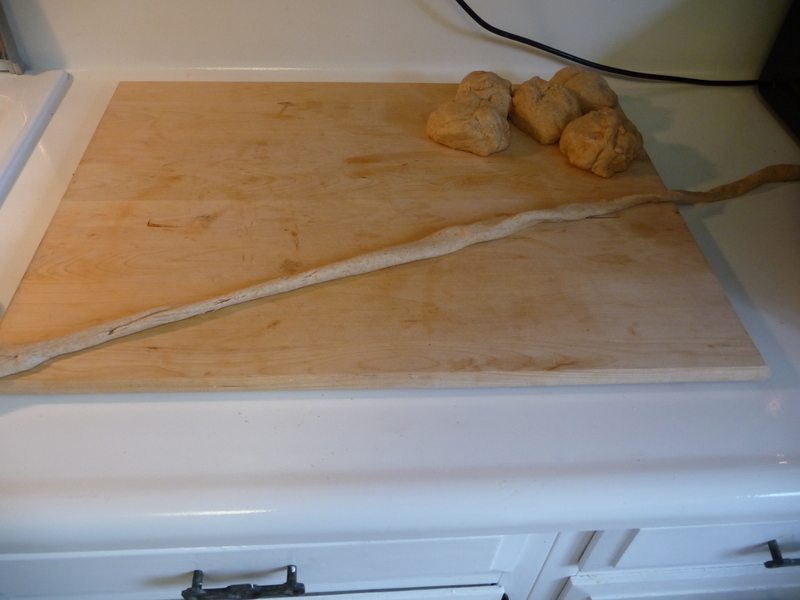 You have to roll the dough into strings 42 inches long. Yes. 42 inches! I don’t think I got that big, because I don’t have 42 inches of counter space. But I did what I could. You have to dip the dough into a mix of 2 TB baking soda to 2 cups of water for 30 seconds. I don’t know why, I guess it has to do with texture. I just do what I’m told. 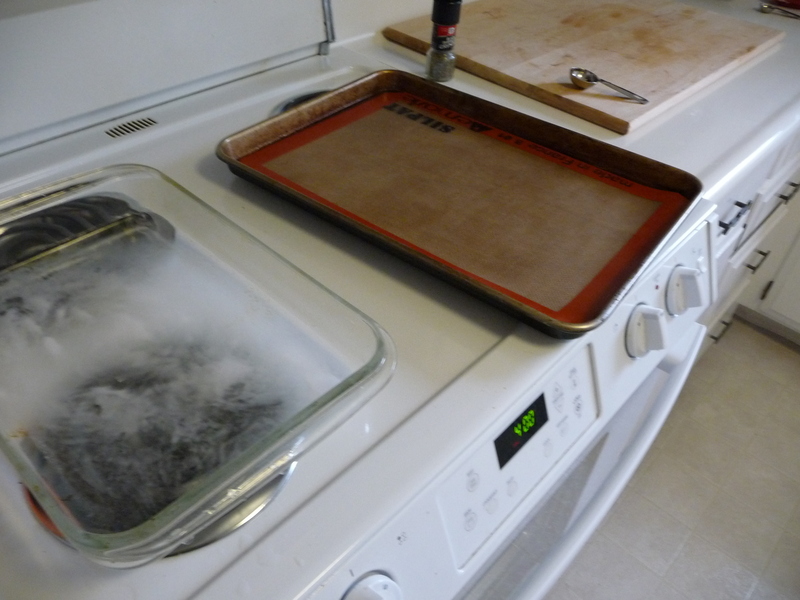 Also, I didn’t have parchment paper, so I used this Silpat. 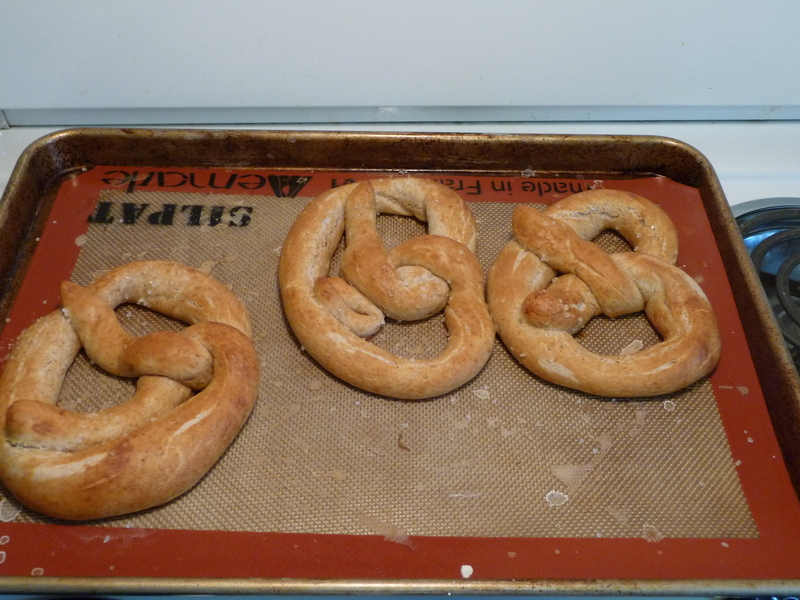 I also used a regular baking sheet, but I wouldn’t recommend it because the pretzels stuck. So use parchment or the Silpat. It said to sprinkle these things with “coarse salt.” I had both Kosher coarse salt and sea salt. I used sea salt on one batch and Kosher on the other. I liked the sea salt better. Of course, I did not use as much as in the picture, because I’m not a fan of overly salted food. 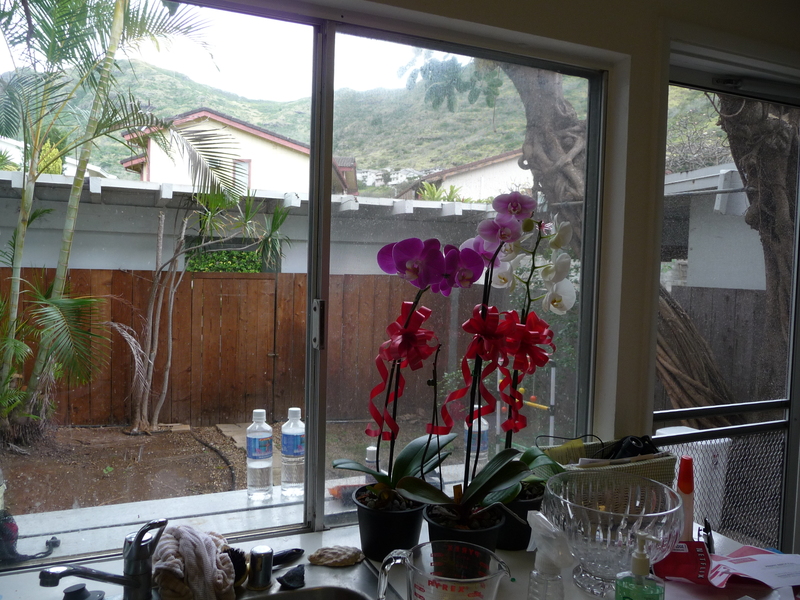 Here’s a gratuitous shot of our Hawaiian back patio. Look at that view! The dirt! The back of the houses! The hill! Please don’t be jealous of my grandeur. The orchid trio was my Valentine’s gift. I’ve wanted to farm orchids since I read THE ORCHID THIEF by Susan Orlean (made into the very good and slightly trippy film, ADAPTATION). But back to the pretzels. Look at that stack of deliciousness!! And they were really good. Even though they were half whole wheat, they weren’t dry at all. Plus, they’re pretty much health food now! Another hint: don’t make these right before dinner, like I did. Unless you don’t want to eat dinner. In which case it’s okay. Ethan had two (snuck one!) but still managed to fork down his steak and broccoli an hour later.